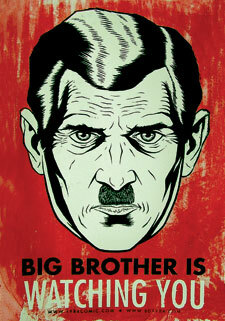 Why can’t they just leave us alone, respect our constitutional right to privacy, and quit spying on us? According to law enforcement agencies, the rising popularity of Internet chat services like Skype has made it difficult to eavesdrop on suspects’ communications. But now a California businessman is weighing in with what he claims is a revolutionary solution—a next-generation surveillance technology designed to covertly intercept online chats and video calls in real time. Voice over IP chat software allows people to make phone calls over the Internet by converting analog audio signals into digital data packets. Because of the way the packets are sent over the Web, sometimes by a “peer-to-peer” connection, it can be complex and costly for law enforcement agencies to listen in on them. This has previously led some countries, like Ethiopia and Oman, to block VoIP services on “security” grounds. In the United States and Europe, too, VoIP has given authorities a headache. The FBI calls it the “going dark problem” and is pushing for new powers to force internet chat providers to build in secret backdoors to wiretap suspected criminals’ online communications. First we had the Patriot Act, shredding our civil liberties and flushing them down the toilet. Next was the National Defense Authorization Act. Who needs the fifth or fourteenth amendments? Who needs habeas corpus? Welcome to a world where we can be locked up indefinitely, without trial, and without charge. Now our government doesn’t even try to hide what they’re up to. They blatantly tell us, “Hey, we’re watching and monitoring EVERYTHING you do. We know who you’re talking to, what you’re talking about, and what information you’re viewing.” They’re already working to put high-tech cameras on every street corner with AI algorithms watching and tracking everything we do. Our phones are already uploading our GPS coordinates to Apple and Microsoft, and the government is probably asking for that data too. Seriously, leave us alone. Before long our television sets will have little cameras in them, uploading a real-time video feed to some dark, secret government compound. This is turning into Orwell’s 1984. This isn’t paranoia. It’s very real and it’s happening right now. They have no right to our Skype conversations. They have no right to our phone conversations. They have no right to read our emails. If you people can’t formulate a case for probable cause and are unable to obtain a search warrant authorized by a local judge in our county, get the hell out of our homes and our lives. You know why you don’t want to get a local search warrant? If you wanted to spy on anyone here where I live, you’d have to get permission from Judge Bill Hickle, who lives here in town with us, and we all know him. We elected him because we trust him. We run into him in the restaurant, we talk with him, and his firm handles our personal business dealings. We know him personally, and if you asked him for permission to spy on us, and you didn’t have good evidence for why you needed to do so, he’d give you the finger, and that’s how it should be. This next video captures how I feel about it all. That’s what’s going on here. The government is looking for answers and can’t create them on their own, so private enterprise sees an opportunity to make some money and jumps to fill the void. The miracles of this process are being used against us.